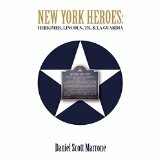 Dr. Daniel S. Marrone will present his book, New York Heroes: Herkimer, Lincoln, TR and La Guardia. Daniel Marrone is a professor emeritus of Business and Management Technology at Farmingdale State College of the State University of New York. A Brooklyn native, he earned an MBA in Management and a Ph.D. in Business Education from NYU. He has undergraduate degrees from Queens College (CUNY) in art history and economics. In 1978. he joined SUNY’s faculty as an instructor at Hudson Valley Community College (World Trade Center Extension Campus). In 1987, he began teaching at Farmingdale State College where he rose through the academic ranks to Distinguished Service Professor. He was also the first Farmingdale State College recipient of the SUNY Chancellor’s Award for Scholarship and Creative Activities. Dr. Marrone has written nearly 40 articles in a wide array of publications. Since 2007, he writes two articles per year for the SUNY University Faculty Senate Bulletin under the byline: Celebrating New York State and New Yorkers. He has published biographies of Brigadier General Nicholas Herkimer, Major General Nathanael Greene, First Lady Martha Washington, Major General Anthony Wayne and First Lady Dolley Payne Madison in American Spirit: Magazine of the National Daughters of the American Revolution. The individuals in New York Heroes faced formidable obstacles and while their accomplishments differ, they all made an indelible mark on New York State history. These individuals rose to greatness and became leaders by eventually triumphing over all adversities with an abundance of "can do spirit". The book is intended for those wishing to study leaders and leadership. On the book cover is the 1942-1943 U.S. Navy Roundel--the insignia painted on World War II Grumman Avenger TBFs (Torpedo-Bomber-Fighters). The author’s father, USN Petty Officer 3rd Class Daniel C. Marrone was an Avenger TBF tail gunner in the Pacific Theater. At the center of the Roundel is the historic marker honoring General Nicholas Herkimer for his valor at the decisive Battle of Oriskany.